Today, January 28, we celebrate the feast of Saint Thomas Aquinas (1225-1274), Doctor of the Church, patron saint of universities and students, and the greatest teacher of the medieval Catholic Church. Alternately referred to as the Angelic Doctor and the Universal Doctor, the teachings of Saint Thomas Aquinas greatly influenced not only Church doctrine, but schools of theological and philosophical thought. Candidates for the priesthood are instructed to model themselves after this holy man, and Pope Benedict XV declared that his teachings were the teachings of the Church, herself. By universal consent, this holy man is the preeminent spokesman of the Catholic tradition of reason and divine revelation. Thomas was born in Aquino, Italy (the name “Aquinas” is not his surname, but translates as “of Aquino”), the son of the Count of Aquino. At the ago of five years old, his father placed him in the care of the monks at the Benedictine Monastery at Monte Casino. He was immediately observed to excel at the scholastic life, and his teachers were astounded not only by his eagerness to learn and aptitude for difficult concepts, but also by the virtuous manner in which he lived his life. As he grew older, he was sent to Naples to continue his studies, where he first encountered the philosophy of Aristotle. Upon ordination, Thomas left Naples and traveled to Paris and Cologne, Germany, where he studied under the tutelage of Albert the Great. Here he was nicknamed the "dumb ox" because of his silent ways and huge size, but his brilliance as a student was evident in his writings. While he pursued his philosophical and theological writings, Thomas held two tenures as professor at the University of Paris. During that time, he resided at the court of Pope Urban IV, under whose direction he combated all forms of heresy and adversaries of the Church. Thomas similarly directed the Dominican schools at Rome and Viterbo, traveling between them as frequently as needed. He received his doctorate at the age of 31. While a gifted preacher, the writings of Saint Thomas Aquinas (which fill twenty volumes) are considered his greatest contribution to the Catholic Church. His writings reconcile the unity of faith and reason, of those things revealed by God, and those things discovered through natural human knowledge. The breadth and depth of his theory encompass the entirety of the natural order, as a cherished and divine gift granted to us by God. Pope John Paul II affirmed the importance of this tradition, saying: "The whole living tradition of the Church teaches us this: faith seeks understanding, and understanding seeks faith. Both the need to understand and the need to believe are deeply rooted in man's heart. It is for this reason that the Church herself was the point of departure for the creation of universities.” Similarly, Pope Benedict XVI asserted, “With his charism as a philosopher and theologian, he [Thomas] offered an effective model of harmony between reason and faith, dimensions of the human spirit that are completely fulfilled in the encounter and dialogue with one another. 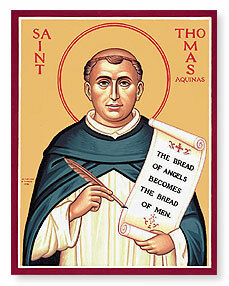 Both the light of reason and the light of faith come from God, he [Thomas] argued; hence there can be no contradiction between them.” Prior to his death, Saint Thomas Aquinas undertook to deal with the entirety of Catholic theology. His most acclaimed work, the Summa Theologiae, although incomplete summarizes the theological underpinnings of our faith in a scientific and rational manner. Saint Thomas ceased writing this work following a supernatural encounter with the Lord while celebrating Mass on December 6, 1273. During Mass, he is said to have heard the voice of Jesus asking him what he most desired. Thomas is said to have replied, “Only you, Lord,” following which he experienced something which he never revealed. Following that experience, he stopped writing, explaining, “I cannot go on… All I have written seems to me like so much straw compared to what I have seen and what has been revealed to me.” Saint Thomas fell ill (likely from overwork) at the Cistercian monastery of Fossa Nuova, and died peacefully while providing commentary on the Song of Songs. His remains were placed in the Church of the Jacobins in Toulouse in 1369.